13X34 WITH A 14' DOOR. GREAT INVESTMENT! 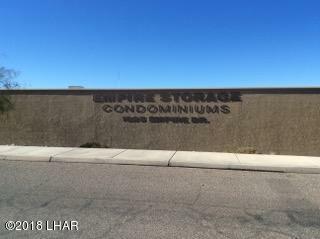 LEASED THROUGH 9/30/19 AND LEASE IS PAID IN FULL. SELLER WILL PRORATE THE LEASE TO NEW OWNER AND CLOSE OF ESCROW. GREAT RV/BOAT STORAGE CONVENIENT TO WINDSOR BEACH. 56' WIDE DRIVEWAYS. PROPERTY HAS A DUMP STATION, RESTROOMS WITH SHOWERS, SECURITY ATE, SECURITY CAMERAS AND IT IS FULLY FENCED WITH 24 HOUR ACCESS. Directions: HWY 95 NORTH TO KIOWA, LEFT, THEN RIGHT ON EMPIRE. COMPLEX IS ON THE LEFT SIDE.